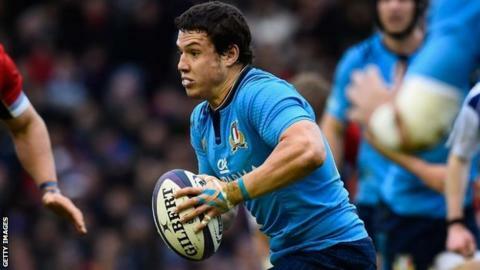 Italy centre Luca Morisi has been ruled out of the Rugby World Cup because of a torn ligament in his right knee. The 24-year-old Treviso player suffered the injury during the 23-19 friendly loss to Wales in Cardiff on Saturday. Centre Gonzalo Garcia, 31, picked up an ankle problem against the Welsh, but is expected to continue his rehabilitation with the rest of the squad. Morisi's Treviso team-mate and fellow centre Enrico Bacchin, 22, has been called up to replace him. Italy are in Pool D in the World Cup, the same section as Canada, France, Ireland and Romania. Italian captain Sergio Parisse is still expected to play in the competition, despite the 31-year-old needing to have fluid drained from his left leg. His side start their campaign against France at Twickenham on 19 September.